Traditional policing is probably the best-known style of law enforcement in the U.S., and it's still the standard. The other law enforcement style is known as community policing. Which is right for you? How can you put your skills to the best use and gain the most satisfaction from your career? Traditional policing involves officers answering calls and patrolling their communities, looking for crimes that have occurred or that are occurring. It's reactive: Officers respond to a variety of situations as they develop. You'll spend your shift addressing challenges or issues as they come up. You have a position of authority over members of the community, but you're also solely responsible for keeping the peace. The buck stops with you, whether it involves protecting citizens or apprehending those who have broken the law. 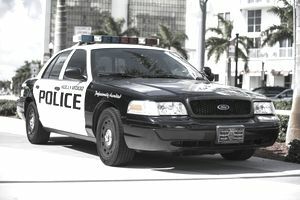 Traditional policing typically involves specialized units, such as narcotics or homicide, at least in larger departments. Officers generally begin as patrolmen, meeting incidents head-on in the streets, with the goal of working up to one of these divisions as detectives. After a period of time that's typically set by statute, detectives and officers alike may take a series of exams to move further up in the ranks to sergeant, lieutenant or captain. They must generally wait until a vacancy for that position becomes available, typically when a sergeant, lieutenant or captain retires, because hiring for these positions is accomplished from within. Community-oriented policing involves officers partnering with their communities to help solve problems and to attack the core problems that lead to crime in the first place. It's thought to foster better relations between police and the communities they serve. Officers are less authoritative personnel than they are adjuncts of the people. There's a greater reliance on citizen cooperation to get the job done. Responsibility for keeping the peace is a shared endeavor. Think of it as serving your community and its citizens rather than controlling them. Community policing is often about more than the crime. It sees crime as a result of other underlying problems. Officers' responsibilities involve addressing and rectifying those problems before they result in crimes, typically with the cooperation and assistance of the public. It might involve social issues such as homelessness. In a traditional policing environment, officers might be responsible for moving the homeless off the streets and perhaps into shelters, but they would not be expected to take action to resolve the homelessness issue itself. Very few of the 12,000-plus local police departments in the U.S. work on the community policing standard, so you may not have a choice as to which field to pursue if you don't want to relocate to a municipality or area that does operate on this concept. Assuming you do have a choice, ask yourself what's most important to you: solving problems at their root or cleaning up their results. Are you a team player or do you prefer to work on your own or with just a partner? In the end, it's a personal decision based largely on your strengths and preferences.